You are currently browsing the category archive for the ‘stone skipping’ category. One hour before the biggest stone skipping tournament on the East Coast, it’s easy to picture yourself winning. 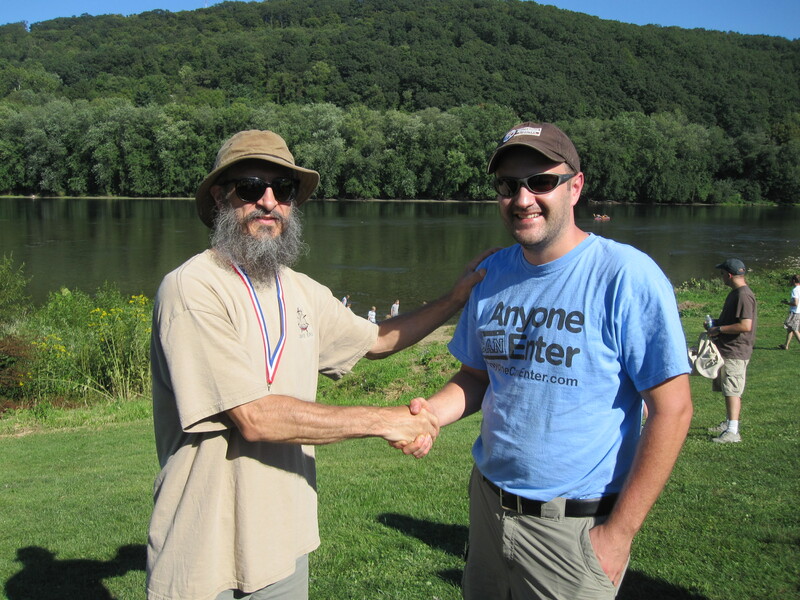 It’s especially easy to convince yourself you have a chance when the Guinness World Record holder and five-time winner of the Pennsylvania Qualifying Stone Skipping Tournament is by your side, gladly offering you advice. It’s even easier when he’s crazy enough to share his bounty of flat, smooth stones that he harvested from Lake Erie. Somehow, this makes you feel like you’re now on an equal level. Throw in the fact that a medical school student from Philadelphia came out of nowhere to beat him last year, that he hasn’t arrived yet to defend his title, and that another top contender—a former Guinness World Record holder—is also nowhere to be seen, and an upset seems all the more attainable. And then the dream takes a dive. The king of stone skipping— a chain-smoking 47-year-old whose main motivation is the pound of fudge awarded to the victor—walks to the edge of the water. He eyes the glassy surface before him and effortlessly flicks a stone downstream. Skip… Skip… Skip… Skip. Skip. Skip. Skip. Skip. Skip. Skip. Skip, skip, skip, skip, skip. Skip. Skip. Skip, skip, skip, skipskipskipskipskipskipskipskipskip. Skip. It’s hard to believe what you’ve just witnessed. A man wearing a shirt that reads “Skips Stones For Fudge” has just skipped a stone at least 30 times across the water. If you hadn’t just seen it with your own eyes, you would think it was only possible in a video game. The most amazing part about all this? Russ Byars is just warming up. Oh yeah. And a few minutes later, a woman asks him to autograph her back. Not on her shirt, either. Right on the skin. Her boyfriend jokes that they’re going to the tattoo parlor to make it permanent. Standing here at the confluence of the French Creek and the Allegheny River, he is a rock star and you might as well become his groupie. Also, the reigning champion and the former world record holder soon arrive. That’s when you finally realize that you don’t have a chance in this contest. With less than 10 practices to my credit during the past month, I wasn’t overly confident, but I knew that I possessed enough raw stone skipping talent to possibly make a run. During my practices in North Carolina, I had impressed at least three spectators with several throws in which I couldn’t even count the number of skips. And that was all with jagged, fat rocks. Both Russ and former Guinness World Record holder Kurt Steiner had promised to share rocks from Lake Erie, which seems to yield the best stones for skipping. The folks who are serious about stone skipping will go there a few times a year, plunder its shores, and return with hundreds of pounds of stones. In the days leading up to the contest, I was eager to get my hands on these stones, and to have my skips officially counted. I was told that this was hardly a scientific method of counting—it’s really just a few volunteer judges standing on the river bank, guestimating, then averaging—but it was better than I could do on my own. And just in case I happened to be some kind of stone skipping wiz kid, I needed a nickname. Something to set me apart. Thanks to some help from my readers, I finally settled on Jon “Ripple Maker” Page. As a first-time contestant, I arrived in Franklin on the last Saturday in August, paid my $5, and entered the amateur division. I was glad that we arrived nearly an hour before the competition began, and especially glad to see Russ had already arrived with a few duffle bags full of stones. He immediately offered me some stones. At first glance, it was clear that these stones were the hot rods of stone skipping. They were flatter, bigger, heavier, and more hydrodynamic than anything I had ever skipped. My first couple of throws were beautiful and the stone skipped more than I’d ever skipped before. I did everything just as I had been practicing. The stone never got too much air underneath it, and most importantly, I threw it with a slightly upward angle so that it wouldn’t dive under the water. I had read about this in a scholarly paper about the fundamentals of stone skipping. Also, I was overemphasizing the spin of the stone, as both Russ and Kurt had told me to do. Even though Russ had plenty of stones, I felt bad about taking them. When he told me and another amateur contestant that plenty of his stones had probably washed up downstream, I went searching. This was probably a mistake. While it was good to practice with these rocks, I tricked myself into thinking that I should compete with them. Problem was, they weren’t the same quality as Russ’ stones. They were still better than anything I had practiced with at home, but they weren’t as flat. Just before the contest, I grabbed two more of Russ’ stones to complement the four best stones I found along the river. In order to qualify for the professional division, I would need to skip a stone at least 20 times. I would have to do it in six tries. After 40 minutes of waiting through the kids’ competition and the first part of the amateur contest, it was finally my turn. My first throw was decent for a first throw, but only skipped 12 times. My second flew too far in the air before touching the water and skipped just twice. My third was no better than the first. My fourth managed 14 skips. I had saved Russ’ stones for my last two throws, but it didn’t help much. My fifth throw sank after only three skips. Down to my last stone, I needed a perfect throw to reach 20 skips and qualify for the pro division. I was five skips shy. It wasn’t until a few minutes later that I realized why. During those 40 minutes of waiting, I managed to unlearn almost everything I learned in the past month, reverting back to the methods I used as a kid. Instead of overemphasizing the spin, I simply threw the stones as hard as I possibly could. Instead of giving the stones a slightly upward angle, I threw them perfectly level with the water. Not that it really mattered. Even if I had focused more on the spin and less on strength, and even if I had kept the stone at a slightly titled angle, I doubt I could have skipped one more than 25. 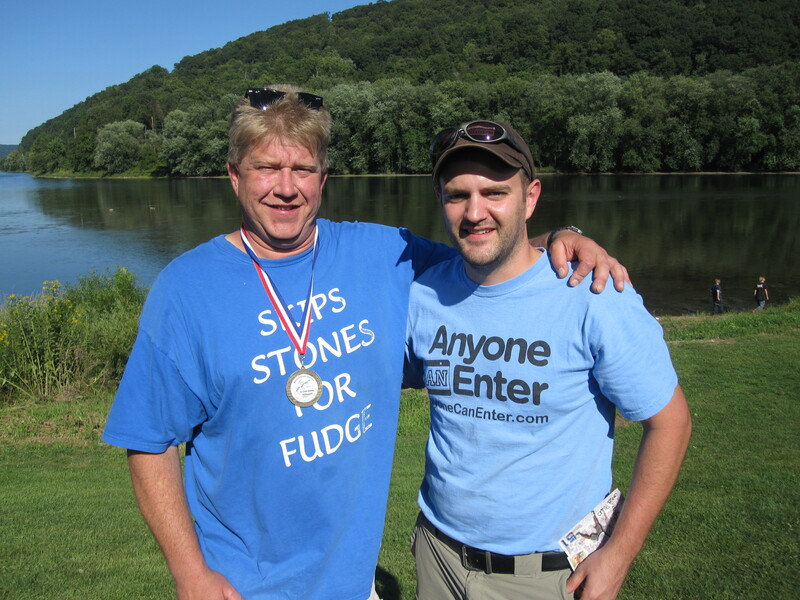 Considering that Kurt finished in second place in the pro division with a best effort of 40 skips and that Russ won on a final-round throw of 42 skips, I think it’s safe to say that my dreams of stone skipping greatness are behind me. But that doesn’t mean that I’ll stop skipping stones. Anytime I go near water, I’ll be sure to scan the shore for anything worth skipping. When I do, I’ll always think of the advice I received from Russ and Kurt, and I’ll do my best to count the skips. I’ll just have to buy my own fudge. Little to my surprise, I’m not going home today with a pound of free Pennsylvanian fudge. Not with a best throw of only 15 skips in the amateur competition at the Pennsylvania Qualifying Stone Skipping Tournament. Even if I had doubled my score, it wouldn’t have been enough. If I was smarter, I probably should have entered the rock painting contest, instead. Later this weekend, I’ll post some video and give a more detailed update. For now, I’m going to watch the pros skip stones. And then I’m going to go buy some fudge. Congratulations and thanks to Brad Wann for submitting the winning entry in my call for stone skipping nicknames. Brad actually submitted two names that caught my eye, but Jon “Ripple Maker” Page is the winner. Thanks to everyone’s participation, it wasn’t an easy decision. Between comments on the blog, Facebook, and a few last-minute entries via text message and phone calls, I had about 30 nicknames from which to choose. Other possible winners included Pebble Pusher, Rock It Man, Rock Steady, and Low Stones. For picking my nickname, I have promised to split any potential winnings (in this case, fudge) with Brad. Unfortunately for Brad, two things are working against this sweet payday. No. 1: How am I supposed to ship fudge to Colorado? And perhaps more important, No. 2: I haven’t exactly been practicing much for this. Part of the problem is a lack of superior rocks in my hometown of Raleigh, N.C. In my past few practice sessions, the best skipping stones I could find were landscaping rocks, and there was a limited supply. Meanwhile, champion skippers like Russ Byars and Kurt Steiner have been practicing with hundreds of pounds of perfectly flat, smooth rocks from the shores of Lake Erie. Fortunately, both champs have offered to give me some stones today. Even if I don’t stand much of a chance, I’m excited to skip a proper stone and even more excited to have my skips counted. On my best throws, even with crummy rocks, I can’t tell the difference between 10 skips and 15. I have a hard time believing that the contest judges can do any better without a high-speed camera, but maybe this is an acquired skill. The important thing is that I’ve got a great nickname. The great ones all have nicknames. Yes, in the sport of stone skipping, you’re only as good as your nickname. At least, you better show up with a good one. Choosing a nickname was easy for Steiner. As a self-described “professional backpacker” with long hair and a nearly equally long beard, Mountain Man was a perfect fit. As a writer, I could certainly create my own stone-skipping moniker, but I’d rather share the fun. That’s why I’m asking you to help me come up with a nickname. To share your ideas, simply leave a comment on this post by this Saturday morning. Feel free to leave as many ideas as you want. Here’s the best part: if I choose your nickname and if I actually place in the Pennsylvania Qualifying Stone Skipping Tournament, I’ll split my winnings with you. That’s right, you’ll have a half-pound of fudge coming your way. Sweet, delicious fudge. Now, let’s create me a nickname! During the past month, I trained for an event so unique, I doubt I’ll do anything quite like it again. Now that pack burro racing is in my past, I’m looking forward to competing in something easier. Something more familiar. Something like stone skipping. I’ll get my chance on August 28 at the Pennsylvania Qualifying Stone Skipping Tournament in Franklin, Pa. Since I can regularly skip a stone more than 10 times, I figured all I’ll need to do is show up, make a few tosses, and proudly accept my trophy. Oh, and the locally produced fudge that also goes to the winner. And the invite to the International Stone Skipping Tournament in Mackinac Island, Mi. But then I watched a few videos of former champions, including world record holder Russell Byars. That’s right, there’s a world record for skipping stones. And let’s just say the record number of skips isn’t in the teens. Try 51. Yes, you’re reading that right. 51.